Make inroads into the Greek business world when you buy our comprehensive Greece email database and you can develop strong B2B contacts that may become longtime customers. Download it and see for yourself what premium data can do for your business! Expand your business presence into the cradle of Western civilization with this Greece email list and you'll be one step ahead of your competitors. 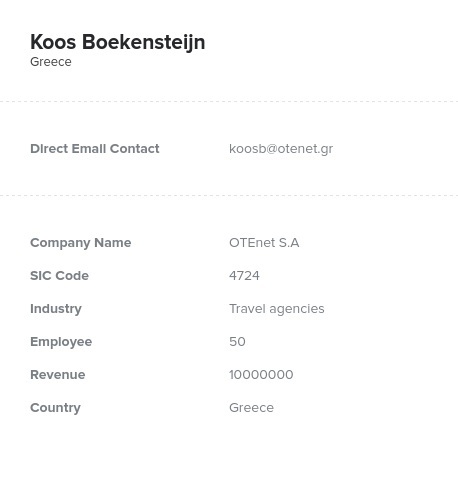 While they're rooting around for possible sales leads, stumbling over outdated contact details, and hitting dead ends by using generic addresses, you'll be reaching out to key figures in the Greek business world using direct, accurate, up-to-date contact information, making new B2B connections, and tallying more sales. Get the advantage you need to dominate the market when you buy this Greece mailing list! Like every business database we sell, our Greek email list contains the real names, company information, phone numbers, direct email addresses, verified mailing addresses, and even fax numbers of the people you need to talk to to bring more clients on board and make more sales. Your accountants will be thrilled once you have this valuable sales tool in hand! Just download this pre-built business database as a .CSV file, input it into your CRM system, and you'll be ready to roll out your marketing campaign. You'll save time gathering data and spend more time closing deals when you trust us to provide the email marketing list you need. Buy it today and see for yourself!